We always seem to have something interesting in the works, but this is a special week for us with two interesting projects unfolding. 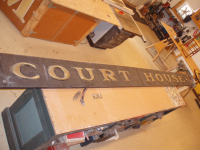 We have a sign in the shop for restoration that is over 100 years old for the County Court House in Keene. It has hand made wood letters that were gilded originally but had been badly painted over at some point. It also had a smalted background which had also been redone at least once but the sign was in remarkably good condition. And we have an old fashioned outdoor wall mural in the works at Prime Roast's newly renovated Brick House Roastery on Rt 101 also in Keene. Here are a couple of shots of each with more to follow soon.